Premiere Boxing Champions announced a major lineup of fights on Tuesday in Los Angeles, California. The highlight of the afternoon? The announcement of an Errol Spence – Mikey Garcia IBF welterweight title bout, which will go down on March 16th at AT&T Stadium in Texas. Garcia, 39-0, will be making a notable jump in weight divisions to face the 24-0 Spence, and will most likely step into the ring a prohibitive underdog, even though both fighters are known as world class talents. Other notable PBC fights will appear on Fox, which recently made a deal with PBC. On January 26th, Keith Thurman, 28-0, will be making his long awaited return when he faces Josesito Lopez, 36-7, in a bout which will be aired live from the Barclay’s Center in Brooklyn. Leo Santa Cruz will be defending his WBA featherweight tile when the 35-1-1 Californian faces the 23- 2 Miguel Flores in another live Fox broadcast, this one from Los Angeles on February 16th. Another major bout will feature WBC welterweight champ Shawn Porter, 29-2-1, as he battles the formidable Yordenis Ugas, 23-3, live in front of Fox cameras in Las Vegas on March 9th. 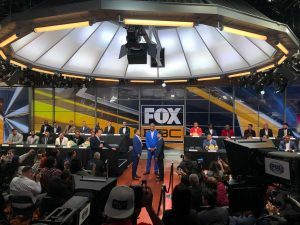 Fox Deportes can now boast of having “International Boxing Hall of Fame member and former four-division world champion Erik ‘El Terrible’ Morales,” on the team, “working with Jaime Motta and Lifetime Achievement Emmy Award winner Jessi Losada.” PBCs fight schedule will begin on December 22nd, when the Charlo brothers showcase their skills in Brooklyn, against Willie Monroe Jr, and Tony Harrison respectively, and will end on April 20th, when Danny Garcia, 34-2, makes his comeback fight against Adrian Grenados, 20-6-2, at a location to be announced.